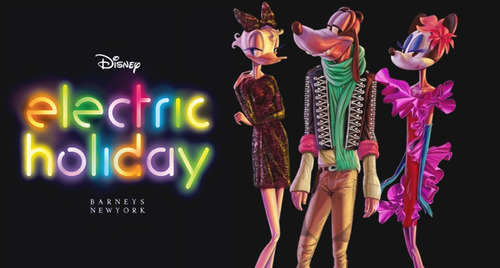 Disney recently released photos for this Christmas’ Electrical Holiday, an animated window display at Barneys New York. In their written news release, they used very fashiony(yes I just invented that word, sue me) terms, so I thought that I would translate. Disney first announced this cool window display back in August. 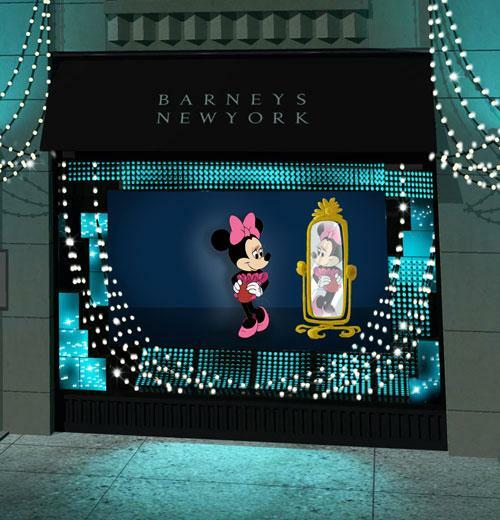 The display is a large screen that is in one of the Barney’s New York windows and follows Minnie Mouse and other members of the Disney gang. The three minute long animated sequence takes you into Minnie’s imagination where she is imagining what it would be like in the high fashion world. 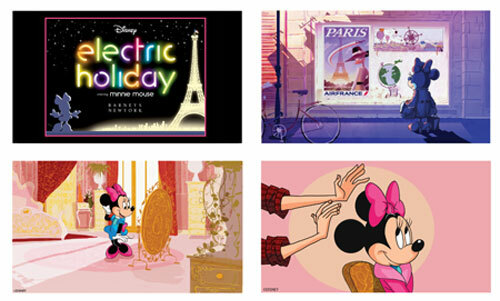 As you can see above and below, Disney has created a highly stylized version of the fashion world taking Minnie to Paris and through a makeover. Disney released an interesting interview with Luis Fernandez, senior vice president of global creative at Disney Consumer Products. Here is Fernandez’s explanation of the display. “Electric Holiday” is a fun and colorful campaign that gave our character artists the creative liberty to do something artistic and completely unique. The elongated poses of Disney characters, including Mickey, Minnie, Daisy, Goofy and Cruella de Vil, are dramatically stylized. They’re creative interpretations from a fashion lens, and only appear for a few seconds in this video. Their true form remains as classic as ever in every aspect of the company. A project like “Electric Holiday” is the kind of creative challenge which forces one to stretch the imagination while proceeding with caution. We know we have to be respectful of who these characters are and what they mean to us and to millions of people. Seeing images of glamour, based on someone who is tall and thin, tends to start giving the wrong signals to children at an early age, who then start to develop what to them, is the perfect body image. The 3-minute video actually reinforces a healthy body image. In the final scene, we see the Minnie Mouse we all know and love. She looks into the mirror and realizes how happy (and fashionable) she is in her designer Lanvin dress. We hope this provides additional clarification. I think that Disney handled the comment wonderfully and I really appreciate how they are so dedicated to answering and helping clarify everything they do. I will take this as a moment to thank Disney for everything that they do. I think that people may spend to much time questioning them and tearing them down for their choices. So, thank you Disney for all of the joy that you bring to us. Does anyone agree? Previous Post: 10 Rides That Your Toddler Will Love! Next Post: Are you ready for the Osborne Family Lights?